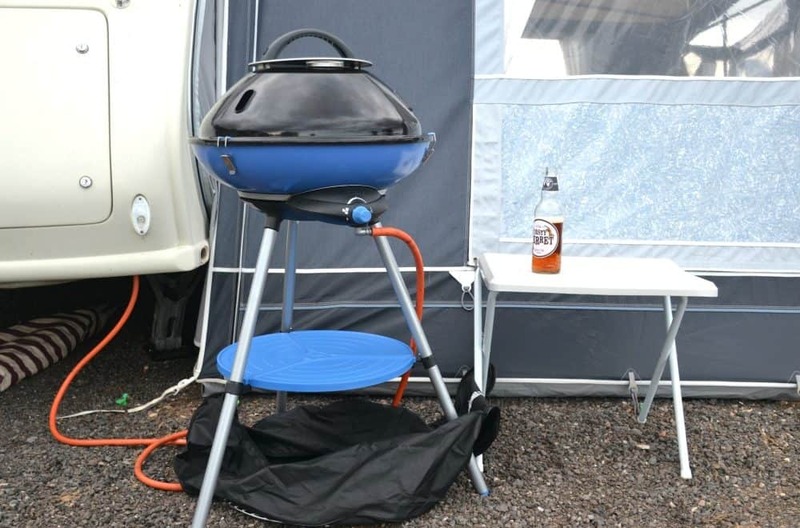 Barbecues are always a highlight of our caravan holidays. We rarely use our hob and oven indoors in favour of food cooked alfresco. So, when CampinGaz offered to send us the CampinGaz Party Grill 600 to test just before our Devon caravan holiday we couldn’t resist. As well as being a barbecue with several cooking options the Party Grill is a portable gas camping stove making it super versatile. Here’s our full review carried out over a two week holiday. 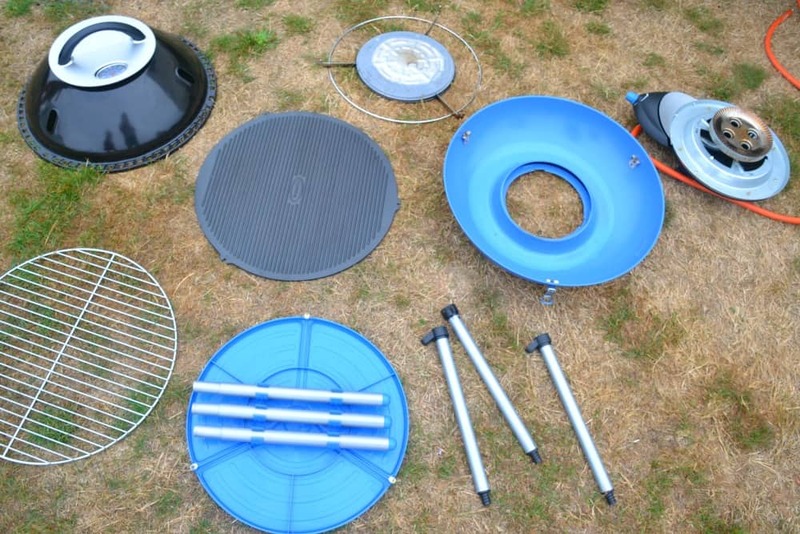 If you’d like an overview here’s a video with a few examples of how we used the CampinGaz Party Grill 600 and how easy it is to assemble, even with help from the kids! The very first test for the CampingGaz Party Grill 600 was catering for a family gathering of 21 adults and children. Our menu was nothing fancy given the large number of people to feed but cooking 18 sausages and 16 burgers is no mean feat. The Party Grill was more than up the task, even in the rain. Over the fortnight we cooked on the Party Grill nearly every day on a smaller scale. 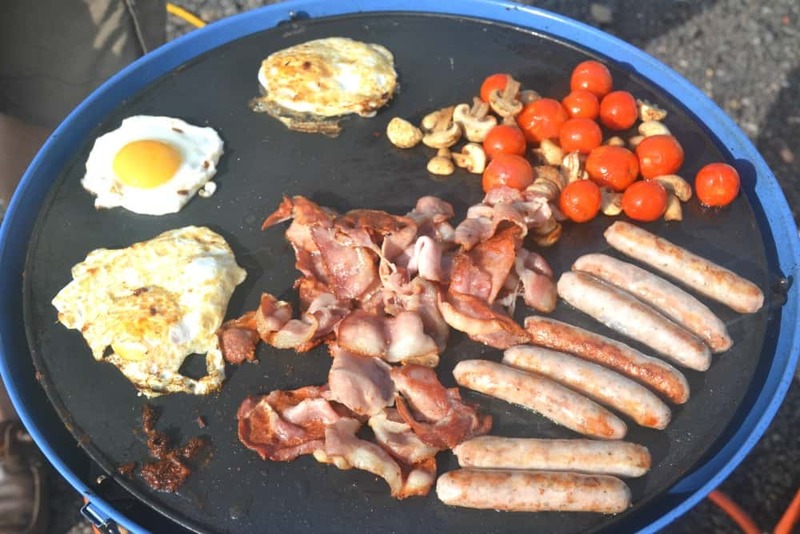 We enjoyed full English breakfasts and pizzas using the plancha flat pan, and barbecues using the griddle which is on the flip side. You can also use the stove to boil a kettle, or heat a pan or wok. The pizzas were a welcome variation to our usual meat heavy barbecues and came out with a stone cooked effect. The only faults we found with CampingGaz Party Grill 600 we were sent is that the Piezo ignition didn’t work. 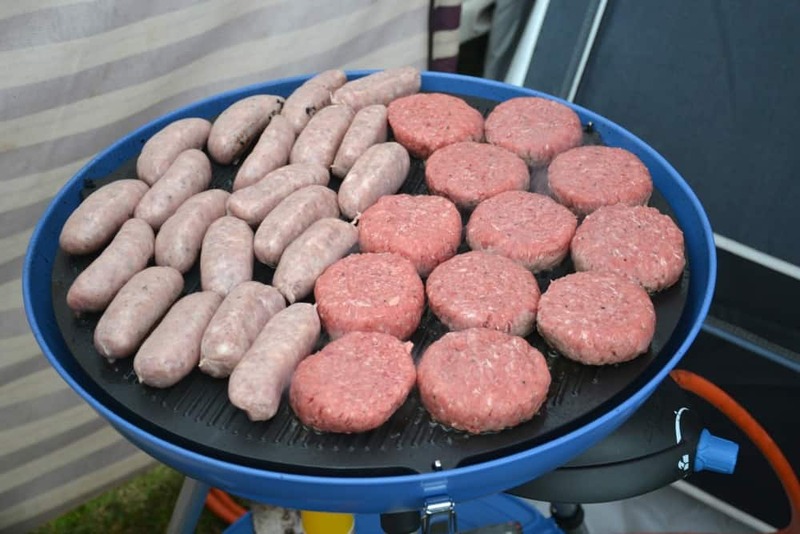 We have owned a Cadac BBQ in the past and found the CampingGaz Party Grill 600 offered all of the same benefits of the Cadac system in terms of portability, versatility of cooking surfaces and quality. 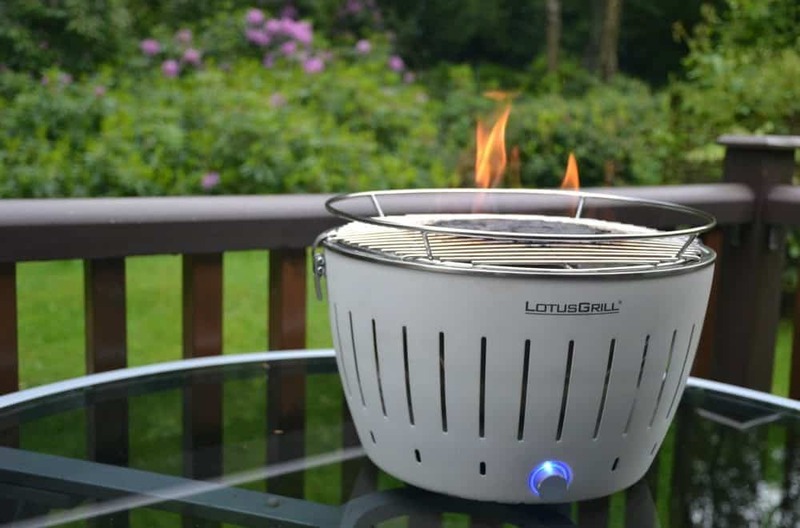 Some features of the CampingGaz Party Grill which set it apart are: the two piece leg design which allows them to be stored and transported within the body of the BBQ and the deep grease catch pan which is designed to be filled with water making cleaning up much easier. The RRP on both items is similar but at the time of writing the CampingGaz Party Grill 600 was available around £50 cheaper than the alternative Cadac Carri Chef 2 making it a bit of a bargain! 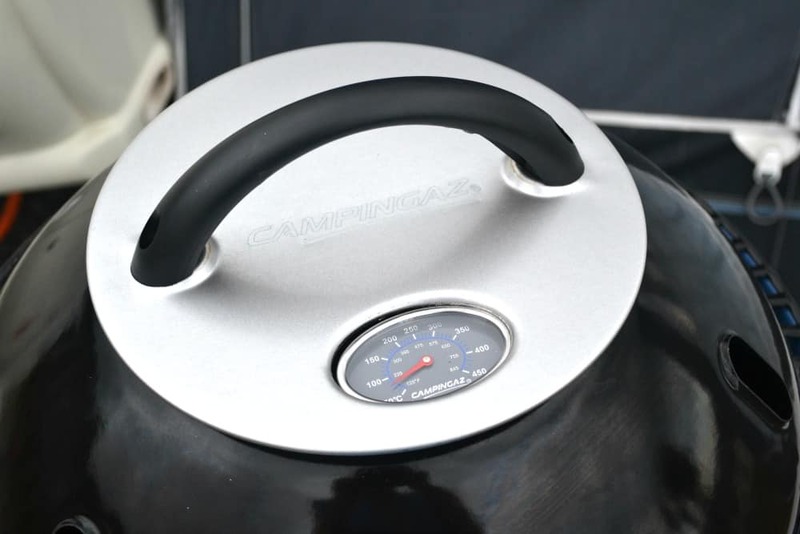 We loved the versatility of this gas camping stove as well as its portability. After a clean with soap and water it packs away neatly into its carry bag. 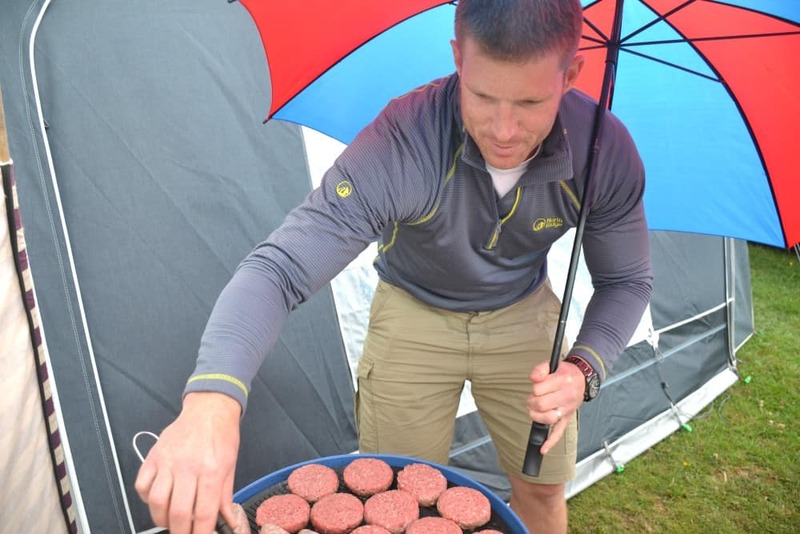 This makes it a great barbecue for camping and caravanning. You can use to to cater for the masses but we think it is the perfect size for every day cooking for our family of four. Smaller sizes of the Party Grill are available. Disclosure: we were sent the CampingGaz Party Grill 600 free for the purposes of a blog review. All opinions are my own and those of my family. Never tried a camping stove but that looks like an amazing barbecue, yum! It is really good and packs away really well for camping and caravan holidays.